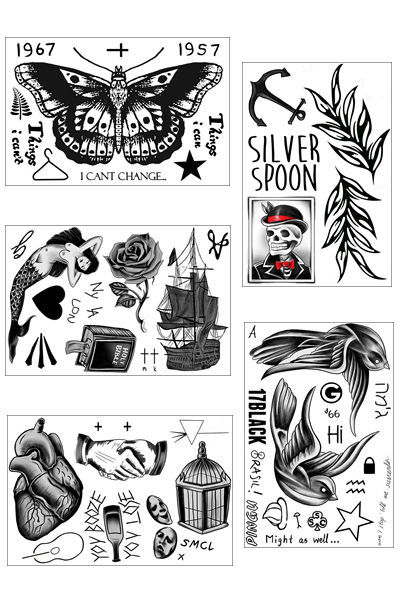 Although the One Direction boys seem to favor tiny little scribbles when it comes to inking up their bodies, Louis finally moved on to bigger (although not necessarily better) things when he upped the ante and got his number 78 and “It is what it is” chest tattoos. 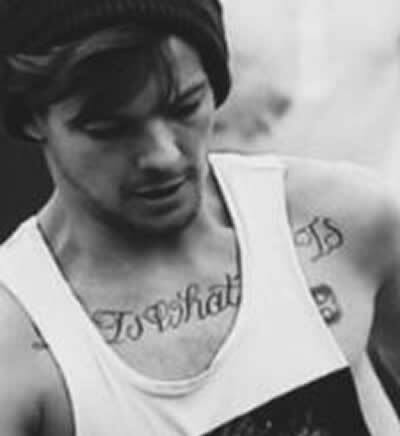 Both of Louis’ chest tattoos remained a mystery for quite a while because of their discreet location, and many people are still unaware of what Louis’ chest tattoos actually say. (Obviously Louis needs to take off his shirt more often.) Don’t worry though; we’ve got the inside scoop on all of Louis Tomlinson’s tattoos and their meanings, so check back with us frequently because the One Direction singer definitely isn’t done getting inked! 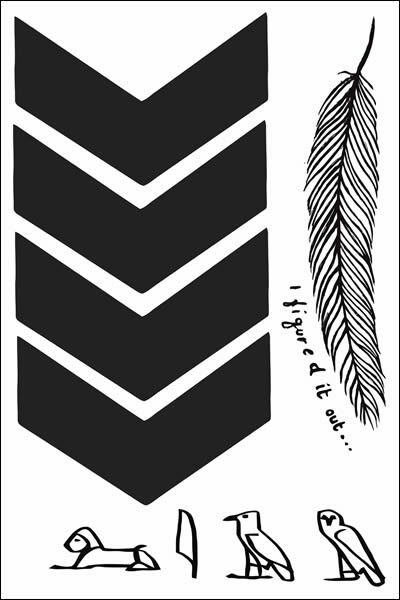 Shortly after Harry Styles debuted the tattoo of two large swallows on his chest, Louis Tomlinson followed suit and got his own gigantic chest tattoo reading “It is what it is” in an ornate scrolling script font. 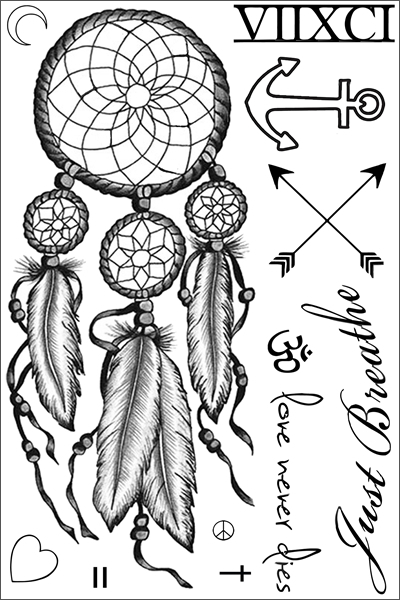 Louis’ chest tattoo was inked at a London tattoo shop in March 2013, and reaches from his left shoulder all the way across his chest to his right shoulder, just above his tattoo of the number 78. We’re not entirely sure what Louis Tomlinson was thinking when he got the gigantic “It is what it is” tattoo on his chest, but we do know the meaning behind it. “It is What it Is” is the name of a song performed by the band Lifehouse, which includes the lyrics: “Too long we’ve been denying, now we’re both tired of trying / We hit a wall and we can’t get over it / Nothing to relive, it’s water under the bridge / You said it, I get it, I guess it is what it is.” Uh oh Louis, trouble in paradise? Update: Louis Tomlinson’s mother revealed the meaning behind the singer’s mysterious “78” chest tattoo on Twitter in September 2013. According to mom Johannah, “For those who have asked me about the ’78’ tattoo on Louis chest…It was the house number of his Nan & Grandad who he adored xxxx.” Aww!! Louis is obviously keeping the memory of his late grandparents close to his heart. So cute! 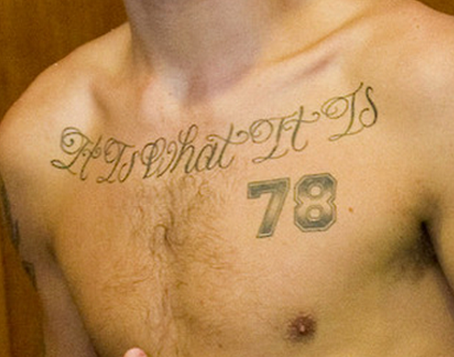 Just below his “It is what it is” tattoo, Louis sports another chest tat depicting the number 78 in a faded black and white design. 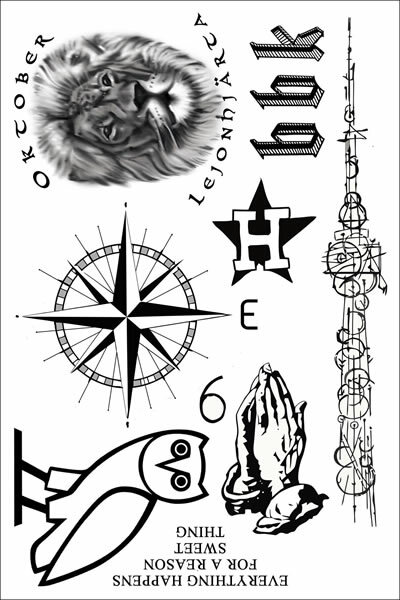 Most people think that Louis’ 78 chest tattoo actually features the number 70, but the white line that intersects the middle of the numbers just makes it hard to see the line that makes the second number an 8, not a 0. 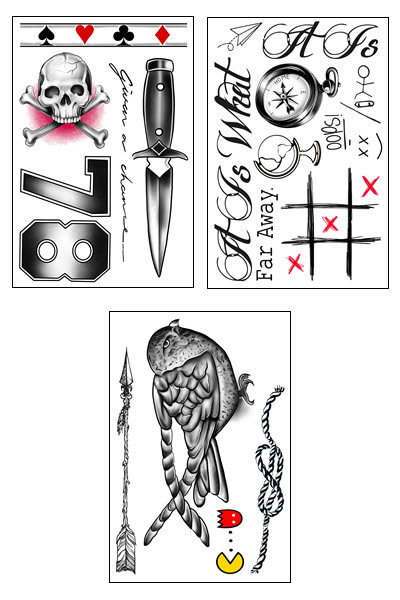 The meaning behind Louis Tomlinson’s tattoo has remained a bit of a mystery, since the singer hasn’t talked about the ink in public, but we have a few good guesses as to what the number 78 might represent. Louis is obviously a huge fan of football (soccer), since he used to play before his One Direction days and actually bought his home town’s football team, The Three Horseshoes, in August 2012, after finding out that they didn’t have enough funds to buy new uniforms. Perhaps 78 was Louis’ uniform number back in his footie days? 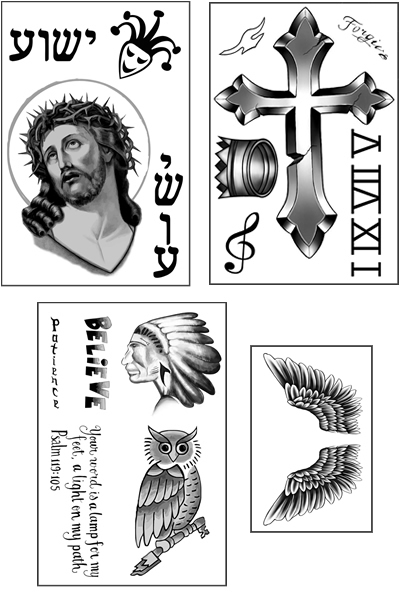 The number 78 could also represent the year 1978, similar to Justin Bieber’s tattoo of the year 1975 on his chest and Selena Gomez’s tattoo of the year 1976 on the back of her neck. 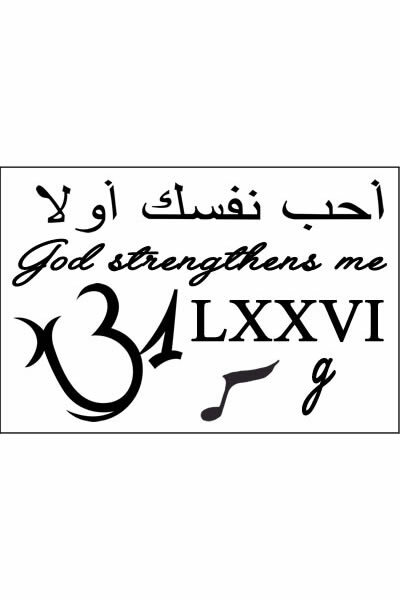 Do you know the meaning behind Louis’ 78 chest tat?